The Indian Navy and Japan’s Maritime Self-Defense Force (MSDF) have started an air-based anti-submarine warfare exercise in the Indian Ocean. 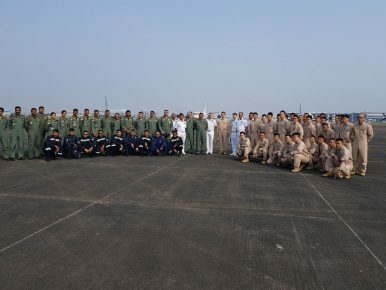 The exercises began on Sunday and are the second major India-Japan exercises this year focused on anti-submarine warfare, following the trilateral Malabar exercises with the United States this summer. The exercise, which is taking place in the Arabian Sea, off India’s western coast, will run through October 31. The Indian Navy has described the exercise as a “coordinated air ASW exercise” and not a joint exercise. India and Japan have steadily increased their military-to-military cooperation over the last decade and are close partners. According to the Indian Navy’s official spokesperson, Capitain D.K. Sharma, the exercise involves a single Indian P-8I long-range maritime reconnaissance and anti-submarine warfare aircraft and an MSDF P-3C Orion anti-submarine warfare aircraft. The exercise would allow crew from both sides to “share domain expertise,” Sharma noted on Twitter. The Indian Navy shared video footage of the Japanese P-3C and the Indian P-8I taking off from an Indian Navy air base at Goa, INS Hansa. Security and defense cooperation between India and Japan has been rising for years now, but the two countries began large-scale bilateral naval exercises in 2012, with exercises known as JIMEX. Though both sides avoid explicitly naming China as a driver of their strategic rapprochement, both Tokyo and New Delhi are concerned by China’s military modernization and naval ambitions in the broader Indo-Asia-Pacific. Chinese submarines have been carrying out regular operations in the Indian Ocean since at least 2015 and possibly earlier. Meanwhile, both New Delhi and Tokyo have aligned themselves with the United States in speaking out in support of a rules-based order in Asia and supporting international legal principles, including freedom of navigation and overflight. Maritime security is a core area of growing cooperation between India and Japan, with anti-submarine warfare a new area of focus for both sides. In September, then-Indian Defense Minister Arun Jaitley and his Japanese counterpart Itsunori Onodera agreed to expand joint anti-submarine warfare training exercises between the two sides. Onodera and Jaitley also agreed to have the MSDF involve more advanced Japanese assets, including the Kawasaki P-1 maritime surveillance aircraft, in next year’s trilateral Malabar exercises.